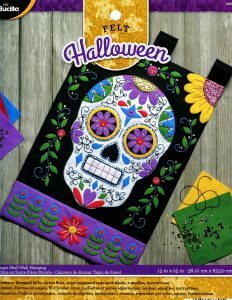 Bucilla Sugar Skull ~ Felt Halloween Wall Hanging Kit #86690 Day of the Dead New - FTH International Sales Ltd.
15″ x 25″ Felt Wall Hanging Kit. The Halloween Ornaments and Fall Wreath kits Bucilla released in 2013 were such a hit that they have come out with more designs in time for Fall and Halloween 2016. Please check my other listings to see all the other Fall and Halloween themed kits. When completed, this “Sugar Skull” Wall Hanging will measure approximately 15″ x 25″. Sugar Skulls have been a part of the traditional decorations for Day of the Dead as well as All Saints Day and All Souls day for centuries in many countries of the world. 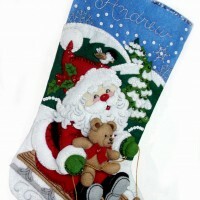 They have just recently been gaining popularity in the US. Sugar art was brought to the New World by Italian missionaries in the 17th century. Mexico, abundant in sugar production and too poor to buy fancy imported European church decorations, learned quickly from the friars how to make sugar art for their religious festivals. Sugar Skull art reflects the folk art style of big happy smiles, colorful icing and sparkly tin and glittery adornments. While there is nothing as beautiful as a big fancy, unusual sugar skull, Bucilla has done their best to create a felt kit that reflects some of the same detail and colorful, shimmering beauty as the traditional folk art style Sugar Skulls. 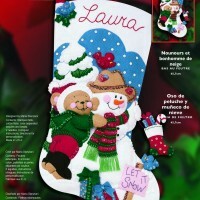 The colorful felt and glittering sequins that embellish this kit will brighten any room you choose to hang it in. 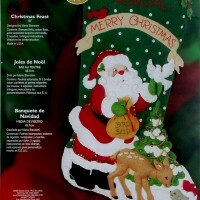 Bucilla felt applique kits are a holiday tradition. This traditional Sugar Skull wall hanging would be a beautiful addition to your holiday decor or a perfect gift for anyone who appreciates a work of love they could cherish forever. This kit is in Brand New Condition, having recently been delivered from the manufacturer. I carry all new inventory that is purchased strictly for resale so these are not old hobby items that have been sitting in a closet gathering dust or getting faded or brittle for a lengthy period of time before being offered for sale. The only way to get these items in newer condition is to pick them up in person from the manufacturer.